I’ve always been of the opinion that Frasier is better than Friends. I say that not because this is just a list of reasons Frasier is better than other shows, but because these two have always felt particularly relatable. They both first aired in the early 90s, they battled for ratings, they were often set in the local coffee house, and they even shared the same first letter and length of title (that last one bears no significance, but it’s still kinda weird). And If you asked a random group of people to name a sitcom beginning with ‘F’ which aired in the 90s, I’d wager about 90% of them would answer “Friends”. My argument is just that the answers should be more even. In any case, lke the best shows, from the airing of its first episode back in September of ’93, Frasier only went from strength to strength, churning out consistently smart, funny storytelling on a weekly basis with never so much as a lull. If you don’t believe me yet, here’s a few reasons why it’s so good. Few sitcoms possess the same level of physical comedy that Frasier offers, which is something that often draws the biggest laughs. For some reason, people just enjoy watching others get hurt and fall over (think about Homer’s constant bodily harm in The Simpsons). Frasier immediately used that to its advantage when it cast David Hyde Pierce as Frasier’s brother, Niles, creating a veritable dream team of comedic performers. With Pierce and Grammer together, the show suddenly found itself with two of the finest physically comedic performers working at the time, playing off each other. Every week. At times they’re like a Laurel & Hardy act, bickering away with each other while they attempt and fail to work together – a running idea throughout the whole series. Every time they ignore Marty’s admonishment and come up ideas like opening a restaurant together, writing a book together or running a psychiatric practice together, it all comes crashing down in hilarious fashion; often a complete descendence into primal sibling fighting. Niles alone often yields the funniest physical moments in the show. His Mr. Bean-like comedy in the ‘Three Valentines’ episode, when he’s trying and failing to iron his trousers before his date arrives, is bona fide gold. 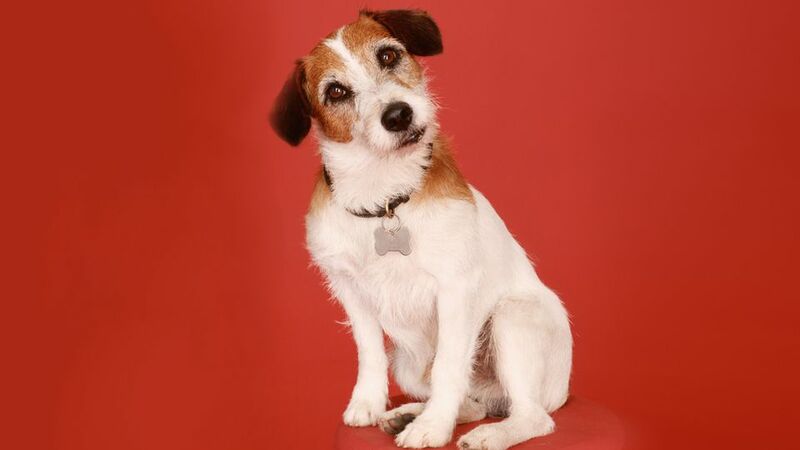 Eddie – or Moose the dog – isn’t just an adorable part of the scenery (although he is utterly adorable with that little tongue that’s always sticking out); he’s actually one of the funniest characters in the show. Most akin to the silent comedian, Eddie’s the Buster Keaton of Frasier, always drawing big laughs by doing very little. The way he intimidates Frasier with his stare or buries his head into a pillow when Marty starts singing is impossibly cute and funny. The silent comedy slant that Eddie brings also compliments Niles’ own more Buster Keaton/Mr. Bean moments (so it’s unsurprising that he’s the only other character around when Niles is ironing those trousers), and feeds into the whole aforementioned physicality of the show. Even when Eddie isn’t the centre of attention, look for him in the backgrounds. He’ll be doing something worth pointing out. Another thing the best shows have is an emotional core. Scrubs was one of the best at this, regularly disarming the audience for twenty minutes with the most wacky humour before ending on a really touching note – touching enough, even, as to elicit tears. But Frasier gives Scrubs a run for its money. It certainly comes close to making us cry in the Season 10 episode ‘Rooms With A View’, when Niles is in for heart surgery and Daphne, Frasier, Marty and Roz await his fate with anxious breath. But it’s never really about making us cry. There’s just such a strong emotional connection to all the characters that we can’t help but feel moved and affected by their fates. In one of the most poignant moments in the entire 11 seasons we see Frasier, Niles and Marty bellowing their romantic woes to the whole of Seattle over quiet, melancholic laughter. The scene works so well because it’s the characters at their most vulnerable and honest. We’re suddenly there with them, empathizing, rather than standing back as a separate party admiring the surface. We always want to laugh, but knowing we’re watching characters with a heart is just as important. Frasier can be brilliantly frustrating. It’s hard not to admire just how clever the writing was week in, week out, because creators David Angell, Peter Casey, David Lee and their writing staff didn’t just write funny jokes; they created labyrinthine comedy. That may sound like hyperbole, but certain episodes are genuinely maze-like, comedic genius – like in Season 5’s ‘The Ski Lodge’, when they all go up to a ski lodge for the weekend and everyone has the hots for the wrong person. Daphne fancies Guy, the gay ski instructor; Niles fancies Daphne; Guy fancies Niles; Annie (Daphne’s model friend) fancies Niles; Frasier fancies Annie. Plotted within twenty minutes inside a tiny cabin, it’s marvellous comedy writing. The same thing can be found time and time again throughout the series, like when Roz is pregnant at a Halloween party but Niles thinks it’s Daphne, and that Frasier is the father, while Frasier is flirting with a different cute girl, and so on… or when Frasier’s date brings over her uncle as a date for Marty, only for Marty to pretend Niles is his boyfriend so he has an excuse to turn him down, or when Daphne and Roz are after the same man, but Daphne’s already lied about being married to Niles which, through circumstance, led to Roz pretending to be married to Frasier. It’s frustrating, chaotic, brilliant stuff. It’s clear that the writers were smart, and that the research was always done. You’ll hear witty references to 16th century art, ancient scholars, obscure opera, theatre and books. Base comedy is great, but who doesn’t love some brains in their humour from time to time? It’s Rachel and Ross, only more. Rarely do we care so much about two characters getting together. From the very first episode, Niles was infatuated with Daphne. As it grew and grew, always through hilarious (and blindingly obvious) swooning, Niles always knew in his heart that he would have her, one day. And all of us were hoping just the same. Frasier can be wonderfully wise at times. The above clip comes from an episode when Roz breaks down on-air due to breaking up with her boyfriend, whom she thought could have become a new father for her kid. Frasier consoles her, along with the whole of Seattle and Spokane, with the profound words. The fact that moments like this are so moving just goes to prove again how much depth the characters have, and how important they become to the audience over the course of the 11 seasons. One of the most interesting episodes Frasier ever aired was ‘Perspectives On Christmas’, which shows us the different ways each character perceives the same situation. While it’s every bit as funny as you’d expect, there’s an extra layer of profundity hiding underneath which highlights the nuances in our behaviour, and how our moods can drastically affect the way we digest information from certain situations or people. Frasier and Niles Crane are super smart, wealthy and successful psychiatrists who live in incredible apartments and wear the finest hand-tailored Italian suits- but that doesn’t stop their insecurities creeping back every chance they get. Like how they’re too proud to take an opera ticket from the cancellation line in front of their snooty friends, and any time a memory from school comes back – like their old bullies who comes to fix the plumbing, Frasier resorting to sitting with his old (nerdy) Glee club at his high school reunion, or Niles becoming a bumbling, love-struck teen when he sees Lana Gardner, the old high school hottie – they instantly revert to their old, insecure, sans-confidence selves. It’s funny to see two respectable grown men acting like children, and it just goes to show again how much the writers cared about filling the characters with substance. Time and time again, this show pushes the boundaries of layered comedy. 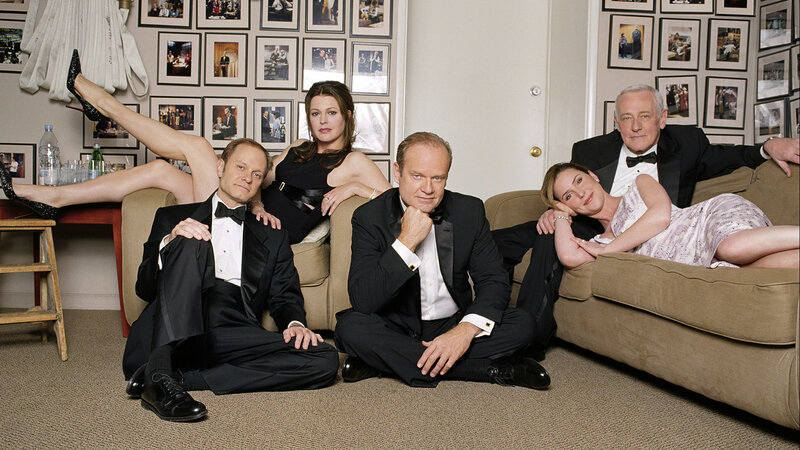 In the end, none of the above would have worked without the right actors, and Frasier was cast to perfection. 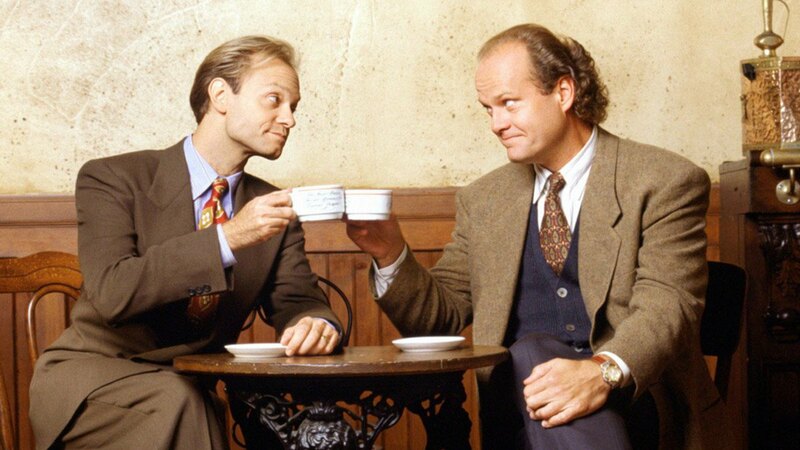 Kelsey Grammer and David Hyde Pierce have already been mentioned for their command of physical comedy, but both also possess the most stellar comedic timing as well as powerful acting ability in the more sombre moments. Traits which are shared in equal by the rest of the principle cast. John Mahoney was perfect for Marty; just the right amount of cranky to offset his more prominent loveable, cheeky side. Jane Leeves started off as the slightly irritating physical health worker but grew into a brilliant, wacky character, and Peri Gilpin (who got the role after Lisa Kudrow had been initially cast) fit Roz’s sarcastic, sultry personality to a tee. As a group – with, let’s not forget, terrific supporting cast in the form of talent like Dan Butler, Tom McGowan and Bebe Neuwirth – they created one of the funniest, smartest and enjoyable TV shows in history. It’s just a shame it had to end. Goodnight, Seattle. We love you. How About A Female 00? I with there was a Love button as well as Like. Your summation of the nine reasons for appreciation are evocative of the wonderful emotions and screaming hilarity of each episode. Ah, life has not been the same since Frasier ended, but thank goodness for dvds. We can relive them over and over again I agree, the series deserves much more appreciation and acclaim. It was truly one of a kind. Fantastic post! I loved Frazier as well, and I agree that it is too often overlooked when reminiscing on great 90s shows. The pants on fire ironing episode was one of my favorites! Thanks, Charlotte! That scene makes me crack up just thinking about it. Great article, certainly the best sitcom of the 90s, maybe even ever? Of the 90s, I think so. I have a top 5 of all time but…it’s tough to call.